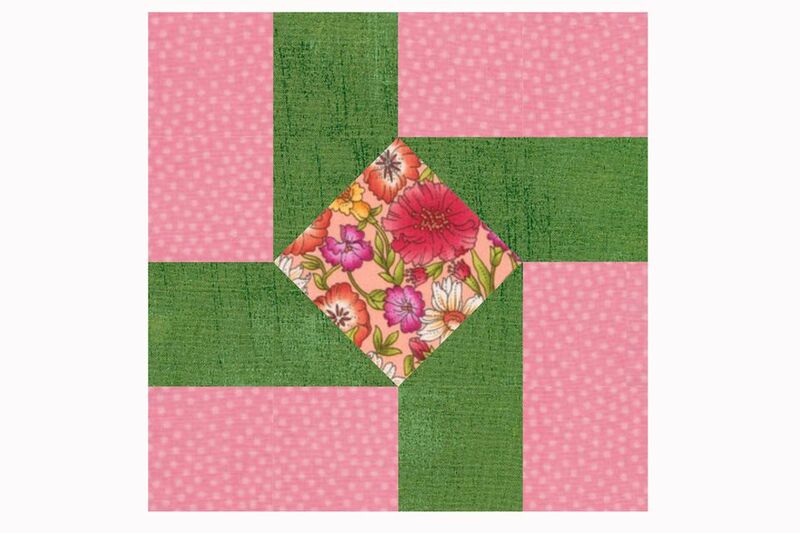 Susannah is an easy patchwork quilt block pattern that's a slight variation of the traditional design. The Susannah quilt block finishes at 6" x 6", a nice size for baby and toddler quilts, wall hangings, or for any purpose. A focal fabric, such as the floral shown in my block, is perfect for the block's center. Small prints and tone on tone fabrics work nicely for the legs that spin out to edges of the quilt block. The patches are all fairly small, so do avoid large scale prints for the legs since you likely want them to look very similar in order to create clear pathways in the quilt. Large prints often look very different when cut into small patches and that could reduce the flow of color. Like nearly any other patchwork quilt block, Susannah can be assembled in different ways. If you're an experienced quilter, change the cutting to sew patches in any way you wish. Eccentric Star is a quilt block that's similar to Susannah. Browse hundreds of designs in my quilt block patterns gallery. Refer to the top row of illustrations. Find the 3-1/2" square cut for the block center. Gather the (4) 2" green squares and draw a line from one corner to the opposite corner on the reverse side of each. Align a marked square with one corner of the center square, right sides together, with line flowing as shown. Secure the patches with a straight pin and sew a seam directly on the marked line. Cut through both layers about 1/4" from the seam, removing the excess corner tip of fabrics. Place an iron on the sewn unit to set the seam. Carefully flip the new green triangle right side up and press it into place. Repeat to create a triangle at each remaining corner. If you're making multiple Susannah quilt blocks, chain piecing will save you lots of time. Add all four corner squares to all centers before setting seams, trimming and flipping triangles right side up. Use a quarter inch seam allowance for the remaining steps. The strip set is shown wider than it truly is so that the illustration wouldn't look like two segments sitting side by side. To make additional quilt blocks, create longer strip sets. Sew the 2" x 4-1/2" pink strip lengthwise to a green strip of the same size — Press seam allowance either direction. Square up one end of the strip set (there's an extra 1/4" to work with, but square up carefully). Starting at the squared up end, cut (2) 2" segments. Sew a 2" x 4-1/4" green strip to the 4-1/4" edge of the 3-1/2" x 4-1/2" pink strip. Sew the remaining 2 x 4-1/4" pink strip under the green strip. Press seam allowances towards the green strip. Square up one end of the strip set — Cut (2) 2" wide segments. Arrange the block's components into three rows. Strip set A segments are positioned on each side of the center square to create the center row. Note that color placement is rotated on each side of the quilt block. Strip set B segments are used to create the top and bottom rows. Note the placement of color. Sew the components of the center row together. Press seam allowances towards the strip set A segments. Sew the top and bottom rows to the block. Press. The quilt block should measure 6-1/2" x 6-1/2".